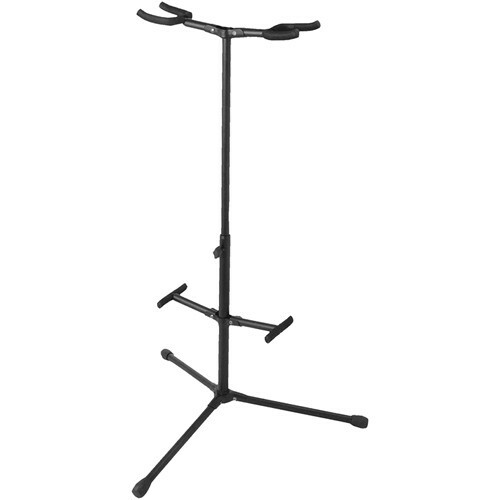 The Hang-It Double Guitar Stand by On-Stage is ideal for home, stage or studio. It features lightweight tubing and adjustable height providing support for two electric, acoustic or bass guitars. It's also a perfectly suitable stand for a pair of Banjos or Mandolins. The tripod base provides reliable stability while the two padded back rests prevent your instruments from getting scratched or scuffed. What's more, the velveteen rubber feet and neck hangers offer additional protection, support and security. When it's time to get up and go, its portable, folding design easily collapses making transport and storage simple. Box Dimensions (LxWxH) 34.1 x 5.0 x 5.0"